The sober reality is that Trudeau represents a continuation of his predecessor's foreign policy. When Justin Trudeau looks in the foreign-policy mirror, who does he see? Someone very much like Stephen Harper. On the world stage Canada under Trudeau the Second has acted almost the same as when Harper was prime minister. The Liberals have followed the previous government's posture on issues ranging from militarism to Russia, nuclear weapons to the Gulf monarchies. 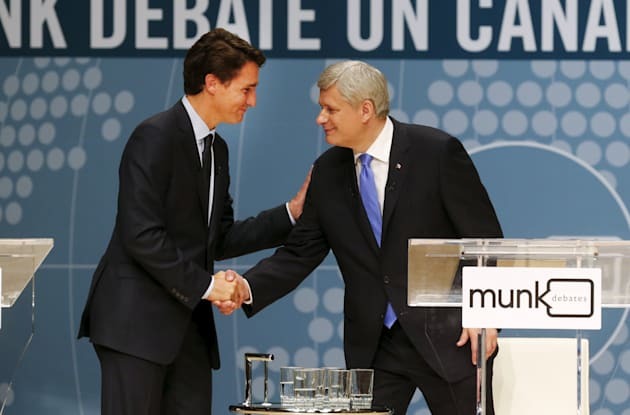 Former Prime Minister Stephen Harper and then-Liberal leader Justin Trudeau (L) shake hands following the Munk leaders' debate on Canada's foreign policy in Toronto, Sept. 28, 2015. Aping the ancien régime's position, the Liberals recently voted against UN nuclear disarmament efforts supported by most countries of the world. As such, they've refused to attend the ongoing Conference to Negotiate a Legally Binding Instrument to Prohibit Nuclear Weapons, Leading Towards their Total Elimination. Earlier this month the Liberals released a defence policy that calls for 605 more special forces, which have carried out numerous violent covert missions abroad. During the 2015 election campaign, Defence Minister Jason Kenney said if re-elected the Conservatives would add 665 members to the Canadian Armed Forces Special Operations Command over seven years. The government's recent defence policy also includes a plan to acquire armed drones, for which the Conservatives had expressed support. Additionally, the Liberals re-stated the previous government's commitment to spend upwards of $100 billion on new fighter jets and naval ships. Initiated by the Conservatives, last year the Liberals signed off on a government-contracted $15-billion Light Armoured Vehicle sale to Saudi Arabia. Trudeau has also maintained the Harper-created Canada-Gulf Cooperation Council Dialogue, which is a platform for foreign ministers to discuss economic ties and the conflicts in Syria, Iraq and Yemen. The GCC includes the monarchies of Saudi Arabia, United Arab Emirates, Bahrain, Oman, Qatar and Kuwait, which have almost all intervened in the devastating Saudi-led war in Yemen. The Trudeau government has continued to isolate Canada from world opinion on Palestinian rights. They've voted against numerous UN resolutions supported by almost the entire world upholding Palestinian rights. The Harper regime repeatedly attacked Venezuela's elected government and in recent weeks the Liberals have picked up from where they left off. The Liberals have supported efforts to condemn the Nicolás Maduro government at the Organization of American States and promoted an international mediation designed to weaken Venezuela's leftist government (all the while staying mum about Brazil's imposed president and far worse human rights violations in Mexico). In March the Liberals renewed Canada's military "training" mission in the Ukraine, which has emboldened far-right militarists responsible for hundreds of deaths in the east of that country. In fact, Trudeau has significantly bolstered Canada's military presence on Russia's doorstep. Simultaneously, the Trudeau government has maintained Harper's sanctions regime against Russia. Nearly two years into their mandate the Liberals haven't restarted diplomatic relations with Iran or removed that country from Canada's state sponsor of terrorism list (Syria is the only other country on the list). Nor has the Trudeau regime adopted any measure to restrict public support for Canadian mining companies found responsible for significant abuses abroad. With regards to Canada's massive and controversial international mining industry, it has been status quo ante. A recent cover of Canadian Dimension magazine provided a cheeky challenge to Trudeau's bait and switch. Below the word "SURPRISE!" it showed a Justin Trudeau mask being removed to reveal Stephen Harper. The sober reality is that Trudeau represents a continuation of his predecessor's foreign policy. I might even need to redo my 2012 book, The Ugly Canadian, but this time with the tagline "Justin Trudeau's foreign policy."